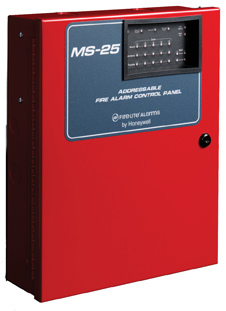 The MS-25 is a 25-point fire alarm control panel designed to provide a cost-effective addressable solution to meet even the smallest specification. Unlike other small panels, the MS-25 is a full featured, addressable alternative…at a conventional panel price. It runs on only a single loop of standard wire, provides pin-point identification and includes maintenance alerts and auto-programming. The MS-25 supports any combination of its own HFS Detectors and Modules. • Listed to UL Standard 864, Ninth edition. • JumpStart® auto-learn feature reduces installation time and makes programming easy. • Two programmable Style Y (Class B) notification appliance circuits (NACs). • Selectable strobe synchronization for System Sensor®, Gentex®, Wheelock® or AMSECO devices. • Two programmable Form-C relays and one Form-C trouble relay. • Point status eliminates calibrated smoke test requirements for NFPA 72. • Alarm verification per zone of detectors. • Honeywell Fire Systems detectors and modules are codewheel addressed for faster installation time. • Central Station reporting up to five zones. • Custom programming performed through the control panel’s built-in browser; no programming software is required. • Single addressable SLC loop which meets NFPA Style 4 (Class B) requirements. • 25 addressable device capacity (any combination of addressable detectors or modules). – Style Y (Class B). – Door Holder Service (cannot be used for notification appliances). – Aux Power Source (cannot be used for notification appliances). • Silence Inhibit and Auto-silence timer options. • Continuous or Temporal code. • Selectable strobe synchronization per NAC. • Up to 2.0 A total output power, 1.0 A for auxiliary power and door holder. Each circuit can source up to the total system current 2.0 A. • Auto-learn “JumpStart®” feature for easy programming reduces installation time. • Two programmable Form-C relay outputs.